This article first appeared on East Niagara Post on May 26, 2015. It is repeated here as I work to put all my book reviews in one place. They will be posted on Thursdays or Fridays and only be altered from the original in that I will add publisher information and pages. Hopefully, by revisiting these reviews, other people might find a book they'd like to pick up for their own enjoyment. Have you ever picked up a book thinking it sounded very interesting only to question what you just read after you finished? 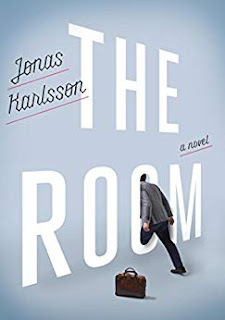 The Room by Jonas Karlsson sells itself as a funny and clever book about a man who discovers a secret room at work that only he can see. Right off the bat, I figured this to be a book that I would love to read. It could have mystery, intrigue, and symbolism to keep me engaged. At the end, I was left scratching my head just a little. It should be noted that Karlsson is a Swedish playwright and that The Room is his first novel. Swedish culture is quite different than ours, so sometimes we have to take that difference into account. There are some references made that would be common to Swedes, but may be difficult for Americans to understand. In addition, some things tend to get a little lost in translation. Simply put, this was an odd read for me, though not necessarily bad. The story is told from the point of view of Bjorn, who is a fastidious worker new to the Authority. Strangely, only Bjorn is able to see a room that his coworkers seemingly ignore. His coworkers see him as condescending, aloof and just plain weird. He feels smarter than them and has no qualms telling them so. The rest of the work crew would like to see him fired. For Bjorn, the room grants him solitude from the boredom of daily work life as well as keeps him from interacting with the lower life forms known as his coworkers. He uses the “office” as a place to do work above and beyond what is required. Meanwhile, the other people in the office see him standing all alone gazing into space with a blank stare on his face. They definitely try to keep their distance. Despite turning in some of his best work, he is banned from this so-called room during the work day. His tenure at his job depends on this. Bjorn cannot understand how so many other people can be missing the obvious placement of the room. He spends time attempting to prove its existence, all to no avail. He is admonished by his supervisor about standing by the wall doing nothing, and other people from the office are told to report if he continues to even talk about the room. What I got out of this book was a study on a man with obvious mental health concerns and social shortcomings attempting to fit into a highly regimented, corporate world. Bjorn is instantly unlikeable, not only to the other characters in the book, but also to the reader. There were several times that his bombastic pomposity drove me to slamming the book down, needing a break from the arrogance. I would surmise that Bjorn is probably Autistic, or at least somewhere on the spectrum. He is extremely good at his job, but only that. He has a very difficult time relating to other people and finds himself to be much happier if he simply avoids them at all costs. For him, the secret room is a refuge from all that distracts him and makes him feel uncomfortable. You can see as you read that he begins to break down as that coping mechanism is taken away. Jonas Karlsson has written his main character very well. While I hated Bjorn at first, I started to pity his social awkwardness as the book progressed. Bjorn is written with a real disconnect with the world around him. You can feel his discomfort and relate to his feelings when faced with a new situation. You know feeling you get when you walk into a room full of people where you don’t know anyone? Karlsson has captured that feeling and relayed it to Bjorn’s everyday life. While The Room was not my favorite book, I did like it and it did keep my interest as I tried to figure out how Bjorn would ultimately face his coworkers and his inner demons. The story read well, and is relatively short at only 192 pages. It is worth taking the time to read, especially if you want something other than the standard, repetitive fare that has infected the book shelves lately. Craig Bacon wishes he had a holo-deck in his attic so he could be a superhero.